William Golding of Boston set up shop as a printer’s supply house in 1869 and soon graduated to the manufacture of seals, then small amateur presses, and finally full-sized jobbing presses. (More at Pearl OS No.1). 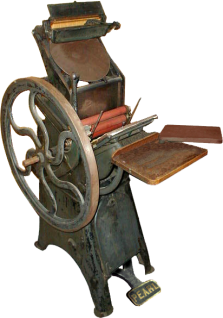 The Pearl remains today one of the most popular presses for amateur letterpress printing. It was made in Oldstyle and Improved versions; pictured is the latter model, made in 1899, which features an impression throw-off lever that the Oldstyle lacks (see Pearl OS No.1). This Improved has been retrofitted with an electric motor. An attached counter (upper left, above ink disc) kept track of the pages printed by measuring printing cycles, and an ink fountain (below counter, above ink disc) supplied ink to the disc automatically. The Improved Pearl No.8 (not shown) was made with a 5×8 chase. “A Brief History of Golding & Co.” by Stephen O. Saxe. Published by the American Printing History Association.